Eizo Radiforce RX340 3MP color diagnostic medical grade LED monitors.3-megapixel high-brightness color monitor ideal for accurate display of chest X-ray, CR and DR grayscale images and color images such as 3D color rendering and image fusion. High-definition and a multifunctional model featuring precise calibration compliant with the DICOM Part 14 standard. 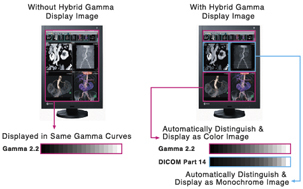 EIZO's unique Hybrid Gamma function distinguishes whether the images being displayed are monochrome or color and displays each image in optimum brightness and grayscale tones. This expands the usability of PACS applications constantly attaining sufficiency with a mix of color and monochrome medical images.